Buy the Aurora Bottled Ink(45ml) Fountain Pen Ink for less. Pen Chalet is an authorized Aurora dealer and all of our products including the Bottled Ink(45ml) by Aurora are guaranteed to be new and authentic. 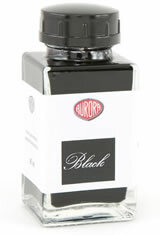 The Aurora Bottled Ink(45ml) Fountain Pen Ink usually ships within 1 business day unless otherwise specified. Each Aurora Bottled Ink(45ml) Fountain Pen Ink we sell is guaranteed to be genuine, authentic and will arrive brand new & unused! I read a lot of reviews regarding black inks because i don't like to use black ink unless i have to. I also keep a running sheet of all inks i have used for comparison sake. This is indeed the blackest ink i have had the opportunity to try on any paper or document i have had to sign. This is the famed Aurora Black that will go in my Aurora fountain pen also from Pen Chalet. It's black and when paired to its partner makes writing sing sweetly. Makes me want to venture out of my comfort zone to....? Blue/Black, oh my! This is my second bottle of Aurora black. The first one lasted many years because I don’t use black that often and it was good to the last drop. When I do use black Iike it black, not dark grey and I also don’t use permanent ink. That’s why I got started using fountain pens to begin with. When I need permanent I use a rollerball. It is a bit pricey but if you are reading fountain pen and ink reviews what difference does a few dollars make to get what you want? Love the blue black ink; only concern was pulling the shipping tab out from the bottle. Wear gloves because your fingers will get ink on them! Other than that, nice looking ink. The blue quickly has become my favorite everyday blue. It has enough of a hint of purple to make it distinctive but not overpowering. It has a fairly good drying time. Mine came shrink wrapped and in a box. The shrink wrapping would not really have saved the ink in the event of a leak but it certainly does speak to the quality of Aurora products. Upon opening this bottle I found a deeply seated plastic cap inside the neck of the bottle. As I tried to get it out, and finally did after much tugging, pushing and pulling, I was covered in ink. I do like the ink though. Such a beautiful ink! I tried it out in the L.A. Pen Show when it first came out, and I was instantly taken by this ink! The shading is wonderful, going from light blue/gray to dark blue/black. If using in a wet-enough pen, you can get some sheen to the ink. For such a low price, you can get one of the best inks out in the market. It's a must-have! My Sales Person was very helpful and suggested Aurora Black as being an excellent ink. From what I have learned- he was right on the mark. Held in esteem by other pen owners, who all agreed on this product. My favorite ink. Always a consistent ink to use-smooth and even color. Not an ink to buy, however, if you need a waterproof ink. Pen Chalet offers the ink at a reasonable price and delivered the bottles I ordered within a couple of days of my order. No, sorry the Aurora Bottled ink only comes in either black or blue.